Parallettes are based off of a well-known gymnastics event, the parallel bars. Since the Parallettes are raised slightly off of the floor you can swing through them, master the handstand push-ups, and test your overall core limit. Strengthening your upper body and core helps improve those two traits we talked about earlier: strength and body control. Our Parallettes are made with a steel construction, and textured coating that provides a premium grip. They can hold any weight without them shifting during your exercises. 24.25"L x 14.25"W x 13"H. 1 ¾” diameter grip. Use your bodyweight as resistance and develop unreal strength and endurance. 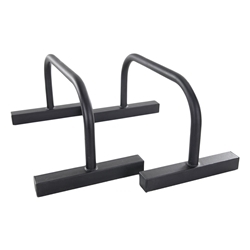 The BMP Parallettes are designed for training elite athletes and casual fitness enthusiasts alike. Standing 14" high, these bars allow for a deep range of motion and room for leg movement. Perfect for HIIT style and crossfit workouts. Once you are able to handle pushups and dips, graduate to L-sit dips and handstand pushups for the ultimate calisthenics challenge. Good price, excellent finish, strong high quality material, much better than other premium brands. I use it at home to keep myself in shape, I was impressed with the quality of this product, you won't find anything similar for a better price. I wish I would have found it before. I do recommend it to other fitness enthusiast customers. It is a definite upgrade from my original homemade set of pvc parallettes. At only $75 for a Steel Parallette Set you will not find a better deal for this quality, compare it to Rogues set which retail over $140. Strengthen your core and upper body, as well as work on mobility, stability, and balance. Order your Steel Parallette Set on sale now for only $75 on Amazon!